The skin is the body's first line of defense against heat, sunlight, injury, and infection. Skin also helps control body temperature and helps the body get rid of excess water and salts (through sweating). 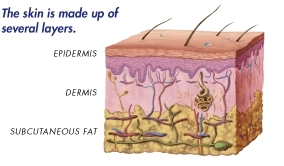 The skin is comprised of several layers including the epidermis (outer layer) and dermis (inner layer). Melanocytes, the cells that make the pigment melanin, are located in the lower part of the epidermis. 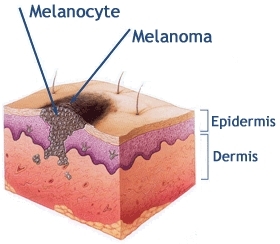 All skin cancer begins in cells of the epidermis, the skin's outer layer. Basal cell carcinoma - most common, slow growing, does not usually spread within the body, can appear as a red patch, sore, or scar on the face, ears, scalp, neck, or upper body. Squamous cell carcinoma - second most common, slow growing, more common in men, may spread within the body, and may may appear as a bump or scaly red patch on the face, neck, arms, scalp, ear, lips, or mouth. Melanoma – least common but is the most serious, can quickly spread to other parts of the body so it is important to detect and treat melanoma in its early stages. Melanoma is the leading cause of all skin cancer-related deaths.